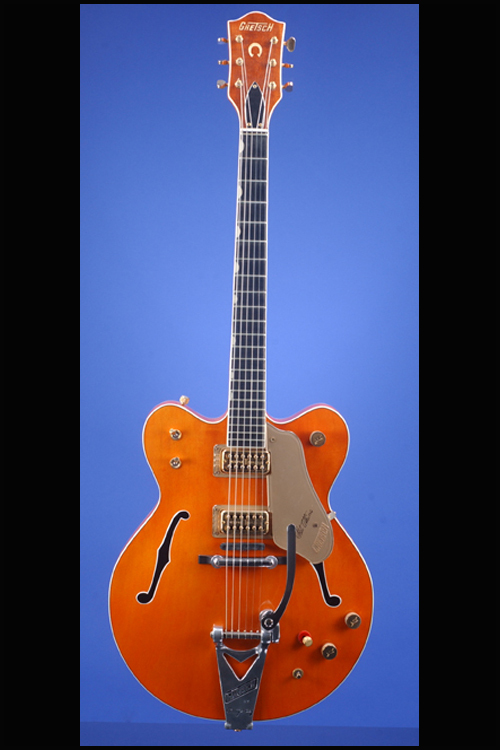 6120 Chet Atkins Guitars | Fretted Americana Inc.
A Near Mint and Totally Original Thinline Double-Cutaway 1964 Gretsch 6120. 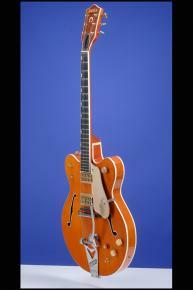 1964 Gretsch 6120 Chet Atkins Hollow Body. This 15 1/2-inch-wide guitar weighs in at 7.90 lbs. and has a nice, fat nut width of just under 1 11/16 inches and a scale length of 24 1/2 inches. Double-bound laminated maple body with painted f-holes, three-piece maple/ebony/maple neck with a medium profile, and ebony fretboard with 22 frets plus zero fret and neo-classic inlaid pearl thumbprint (half-moon) position markers. 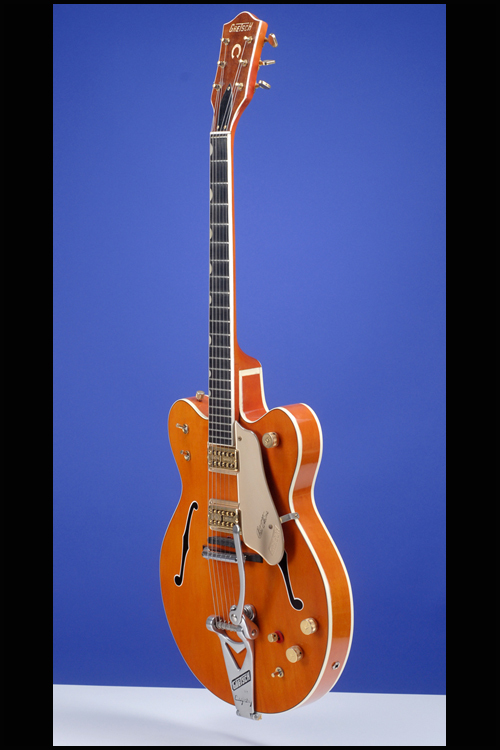 Brown mahogany-stained headstock with inlaid pearl Gretsch "T-roof" logo and pearloid plastic horseshoe inlay. 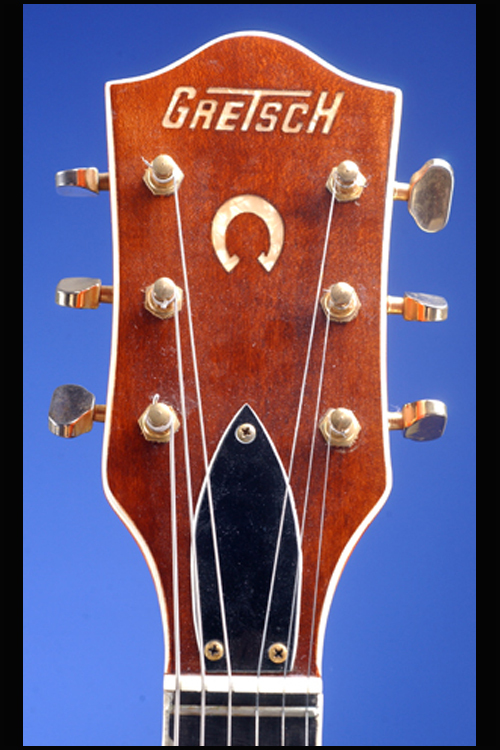 The serial number ("72221") is on the top edge of the headstock. 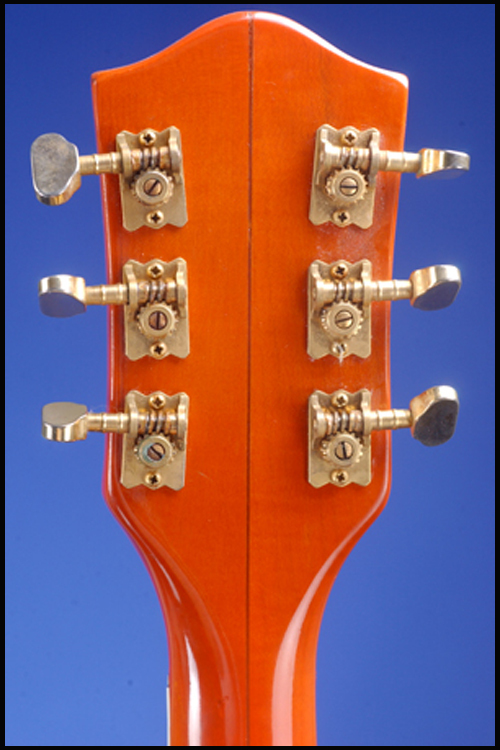 Individual open-back Van Ghent tuners with 'petal' shaped metal buttons. Two Filter'Tron pickups with outputs of 4.08k and 4.02k. 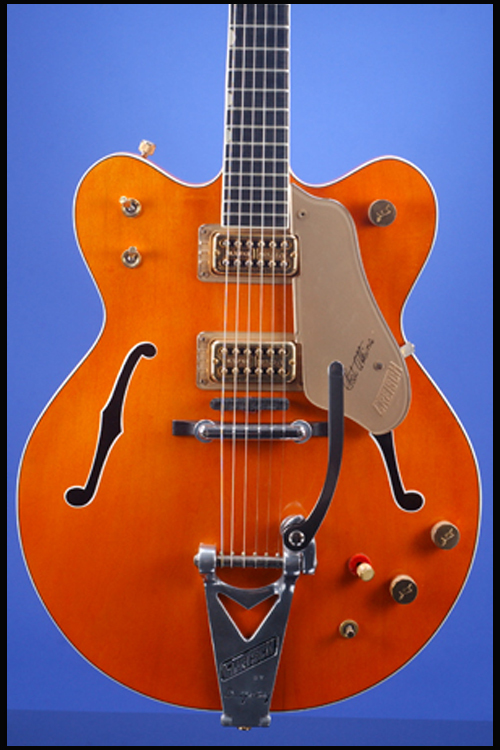 Gold Lucite pickguard with pantograph-engraved Gretsch "T-roof" logo and "Chet Atkins" signature in black. Three controls (all volume) and three three-way selectors plus one string damper control. 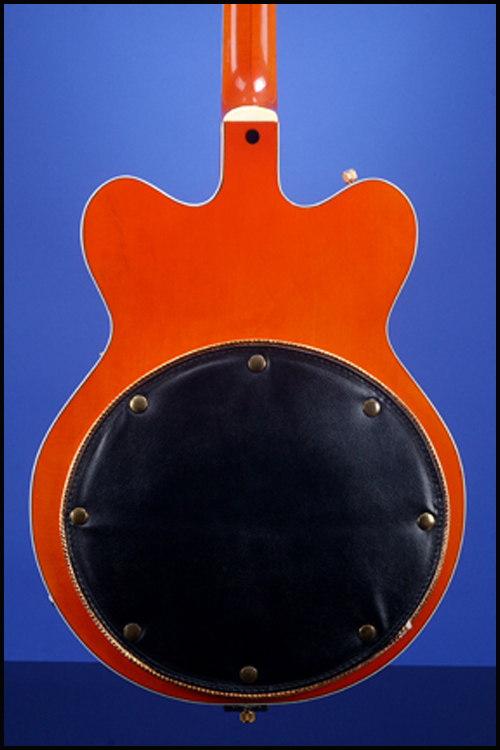 Gretsch "Arrow-through-G" knobs with cross-hatch pattern on sides. Aluminum Bigsby bar bridge and aluminum V-cutout B-6 Bigsby ("Gretsch by Bigsby") vibrato tailpiece with pivoting arm. Pad on body back. All hardware gold-plated. 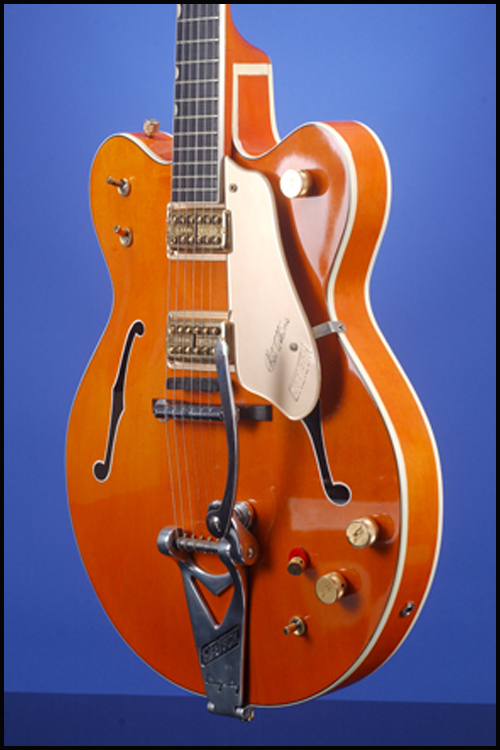 This near mint guitar is exceptionally clean and totally original. In the original "Cowboy" white Tolex and tooled leather hardshell case with burgundy plush lining (9.00). 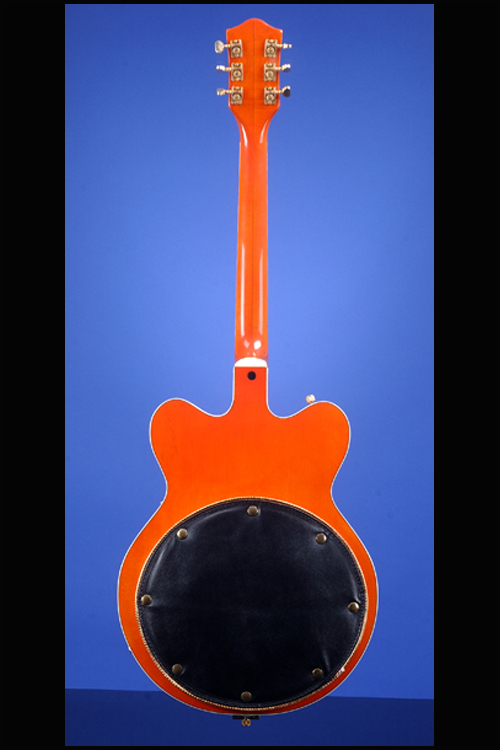 John Lennon used exactly the same model (a 1962 guitar) during the 'Paperback Writer' sessions at Abbey Road Studios in April 1966.